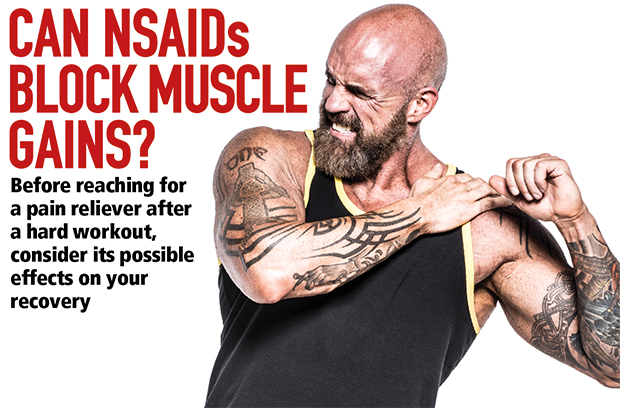 Can NSAIDs Block Muscle Gains? If you’re like some lifters, days aren’t measured by Mondays, Tuesdays, and so on, but by arm day, chest day, leg day, and the like. Hump day is always whichever day legs fall on because once you clear that hurdle, everything coming is a breeze by comparison. One by-product of a good leg workout is the delicious post-workout soreness—called delayed-onset muscle soreness, or DOMS—the kind that makes walking up a pair of stairs feel so good. And sometimes, perhaps not. That soreness can in fact linger for a few days, which may tempt you into taking an over-the-counter pain reliever or anti-inflammatory. Sounds reasonable so far; sports-medicine practitioners and athletes have taken non-steroidal anti-inflammatory drugs (NSAIDs) such as aspirin or ibuprofen, which are popular choices to minimize pain and inflammation after sprains, strains, and other acute soft-tissue injuries. NSAIDs are classified in different ways, not only by whether they’re over-the-counter or prescription drugs but also by chemical structure and the drug’s half-life (the time necessary to eliminate half of the ingested amount of drug from the body). As for what’s in various OTCs, check out the active ingredients in the sidebar. Can NSAIDS Blunt Protein Synthesis? But there’s more, because the lifter must also weigh performance side effects. In a study of rat and mice models, researchers looked into the effects of taking ibuprofen on cyclooxygenase (COX) activity because it has been demonstrated that COX activity is a critical component of muscular hypertrophy.2Because drugs such as ibuprofen are classified as COX inhibitors and COX activity is a critical component of muscular hypertrophy, a clear link has been established: Ibuprofeninhibitsmuscular hypertrophy. In another study, researchers demonstrated that COX activity is required for muscle growth possibly through facilitation of extracellular protease activity, macrophage accumulation, and cell proliferation.3Hence, taking a drug that inhibits COX may very well be counterproductive for muscle gains. Let’s remember these studies are typically done with untrained individuals, so that can skew how the results might affect a highly trained athlete. What’s more, acute changes may not reflect long-term adaptations with muscular hypertrophy. No doubt there’s a time and place to use NSAIDs, but they should be taken with caution, in relatively moderate dosages, and for short periods of time. A review of the practical management of NSAIDs in athletic injuries determined that NSAIDs aren’t recommended in the treatment of chronic muscle injuries or completed fractures or stress fractures.9The authors recommended NSAIDs for the management of acute ligament strains, muscle strains, tendinitis, and eccentric muscle injury, but they cautioned that the prescription of the NSAID should be judicious and the length of treatment should be kept as short as possible. NSAIDS can help with short-term pain management, but their use should be avoided not only because of their potential long-term side effects but also because of their possible effects on making gains in muscle mass. 1 Almekinders LC. Anti-inflammatory treatment of muscular injuries in sport. An update of recent studies. Sports Med. 1999 Dec;28(6):383-8. 2 Clanton TO, Coupe KJ. Hamstring strains in athletes: diagnosis and treatment. J Am Acad Orthop Surg. 1998 Jul-Aug;6(4):237-48. 3 Hertel J. The role of nonsteroidal anti-inflammatory drugs in the treatment of acute soft tissue injuries. J Athl Train. 1997 Oct;32(4):350-8. 4 Trappe TA, Carroll CC, Dickinson JM, et al. Influence of acetaminophen and ibuprofen on skeletal muscle adaptations to resistance exercise in older adults. Am J Physiol Regul Integr Comp Physiol. 2011 Mar;300(3):R655-62. 5Krentz JR1, Quest B, Farthing JP, Quest DW, Chilibeck PD. The effects of ibuprofen on muscle hypertrophy, strength, and soreness during resistance training. Appl Physiol Nutr Metab. 2008 Jun;33(3):470-5. 6 Petersen SG, Beyer N, Hansen M, et al. Nonsteroidal anti-inflammatory drug or glucosamine reduced pain and improved muscle strength with resistance training in a randomized controlled trial of knee osteoarthritis patients. Arch Phys Med Rehabil. 2011 Aug;92(8):1185-93. 7 Petersen SG, Miller BF, Hansen M, Kjaer M, Holm L. Exercise and NSAIDs: effect on muscle protein synthesis in patients with knee osteoarthritis. Med Sci Sports Exerc. 2011 Mar;43(3):425-31. 8 Mikkelsen UR, Langberg H, Helmark IC, et al. Local NSAID infusion inhibits satellite cell proliferation in human skeletal muscle after eccentric exercise. J Appl Physiol (1985). 2009 Nov;107(5):1600-11. 9 Mehallo CJ, Drezner JA, Bytomski JR. Practical management: nonsteroidal antiinflammatory drug (NSAID) use in athletic injuries. Clin J Sport Med. 2006 Mar;16(2):170-4.